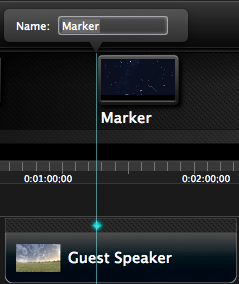 For videos shared to Screencast.com or exported as a web page, you can add a table of contents based on the markers on the timeline. The table of contents adds navigation points to allow viewers to jump to specific sections within your video. 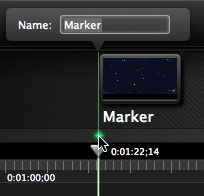 To add a global marker, click within the markers track in the area above the playhead, or press Option-M.
To add a media-based marker, click in the area just above the media on the timeline. All markers added to the timeline appear as table of contents entries. You cannot select which markers to display in the table of contents. Enter a marker name. The marker names appear as the table of contents entry. Table of contents is only available when sharing to Screencast.com or exporting to local Flash. Select Share > Screencast.com or Share > Export as Web Page. 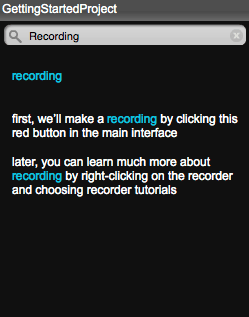 For Screencast.com: Log in and select the "Create table of contents from markers" option. Click Share. For Export as Web Page: Select the "Create table of contents from markers" option. Click Export. Click the Table of Contents button on the player bar. Enter the search term into the field. Select a result. The video jumps to the location where the text appears within the video.